I am so excited to share that A Little Soapy Business has just turned 1 year this month! It’s been such an incredible journey and I appreciate you all for sharing your feedback, being my guinea pigs and sharing my passion for natural products. An anniversary can only mean it’s time for a give-away! Yeah!!! 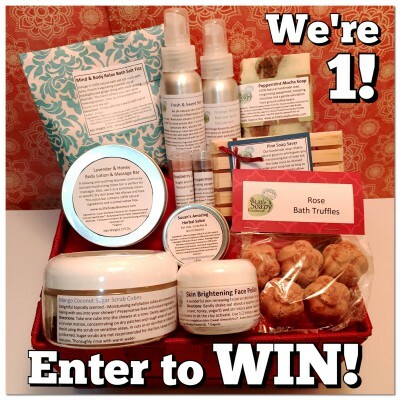 Enter here to win an all-natural, preservative-free gift basket from A Little Soapy Business valued at over $100! Click here for Contest rules and details. Enter your email address to follow this blog and receive notifications of new posts by email including exclusive recipes, events and new products.